I breathed in deeply, watching snowflakes amass on the hill, seeing volunteers work hard to clear the track as the familiar Canadian mountains looked down over me. I heard my name shouted, along with terms of endearment and motivation, “Let’s go Erin, you can do this.” I was about to race down a mountain, turning around 61 gates in 50 seconds. The clock would be the final judge and it would come down to the hundredths of seconds. Mistakes would be costly, and the consequences of being even a centimetre off-line could end my race. I took another deep breath to steady myself, and tried some self-talk, “Come on Erin, just pretend it is any other race.” However, as I glanced down my eyes caught sight of five multi-coloured rings painted on the starting post. At that exact moment, I knew that this was no ordinary race. I was racing for Canada at the Olympic Games and the first chapter of my Olympic journey had begun; bringing with it both honour and responsibility. At 19 years of age, I competed in the Vancouver 2010 Olympics with only two World Cup races under my belt. I wasn’t planning to compete, but days before the Games began, our alpine skiing quota increased, and I was named to the Canadian Olympic Team. After getting over my initial shock, I packed up my things and left our junior team to join the World Cup team. I had no idea what to expect. I hardly knew these older, intimidating athletes, and I had barely worked with the World Cup coaches. I was the young, shy rookie on the team following the girls around wide eyed and with a sense of deep awe. I considered myself incredibly lucky to be a participant at the Games, and my favourite Olympic memory is still crossing the finish line in 20th place, in front of a hometown crowd. As I neared the finish line, I was focused, present, and then all of a sudden… completely blown away. The crowd roared to life. They shook their Canadian flags, waved their red mittens and stomped their feet. A sea of red, white and black erupted from the stands, supporting me, believing in me and having the time of their lives. I was overwhelmed by the unconditional support for one of their own. After the Vancouver Games, my international ski-racing journey truly began. In February 2012, after years of consistently placing in the top 30, and occasionally placing in the top 15, I had what most people would call the pivotal point in my career. In Ofterschwang, Germany, I became the first Canadian woman in 41 years to win a World Cup slalom race. People began to take notice of the quiet perfectionist from Canada, and I thought that I too had reached the turning point in my career. I had another podium finish less than a year later, and I ended the season ranked 11th in the world, while being a consistent threat to the top 10. I remember saying on camera to the press, “For those of you who are struggling, just keep pushing because it is all worth it.” I was living a dream. However, I did not know that bigger struggles awaited me in the future. My relative inexperience had its advantages. The summer before the Olympics in Sochi, I worked harder than ever and strived to be the perfect athlete. I pushed myself to my limits in the gym, I worked with a sports psychologist, I had good testing results, I was skiing fast, and I was ready to be a medal contender at the Olympics. I had an upwards trajectory for much of my career, and I put strict expectations on myself about always improving my world ranking, always finishing, never getting sick, skiing fast every day, as well as always being kind and staying true to myself. It was a high bar, but one I was hopeful to attain. Needless to say, things didn’t happen as planned. I had some health issues at the beginning of the season, followed by severe back pain from an undiagnosed spondylolisthesis at L4/L5 of my spine. The biggest challenges were the expectations that I had put on myself. With each race that I didn’t finish, after each tough training day, and with all the individual occasions where I failed to meet my own expectations, my confidence was gradually eroded. Heading into Sochi, due to back pain, I could barely train on the hill or in the gym. However, standing in the start gate I remembered all the hard work that I had put into that moment and I focused on the beautiful feeling of skiing. I pushed out of the start gate with confidence that I didn’t know I had. I found my flow, my rhythm, my aggression; two thirds of the way down on my second Olympic slalom, I was in fifth place. However, my timing was off by a few hundredths of a second, and I straddled a gate, and with that, my day was over. I have had a good career with multiple top five, 10 and 15 finishes, and my career highlight is winning a silver medal at the world championships as the captain of the team event. However, many days of struggle were littered in there as well. Our coaching staff changed three times since Sochi. I tried to make everyone happy while hearing the contrasting advice; eat a lot, eat less, take risks, be safe, relax, fight, be selfish, be kind. I listened to each piece of feedback and consequently ended up telling myself, “Be yourself, but change entirely.” In every aspect of my life I strived for perfection, ending each day exhausted. I was a robot with different programmers, a few wires crossed, and running low on battery, and this was evident in my skiing. 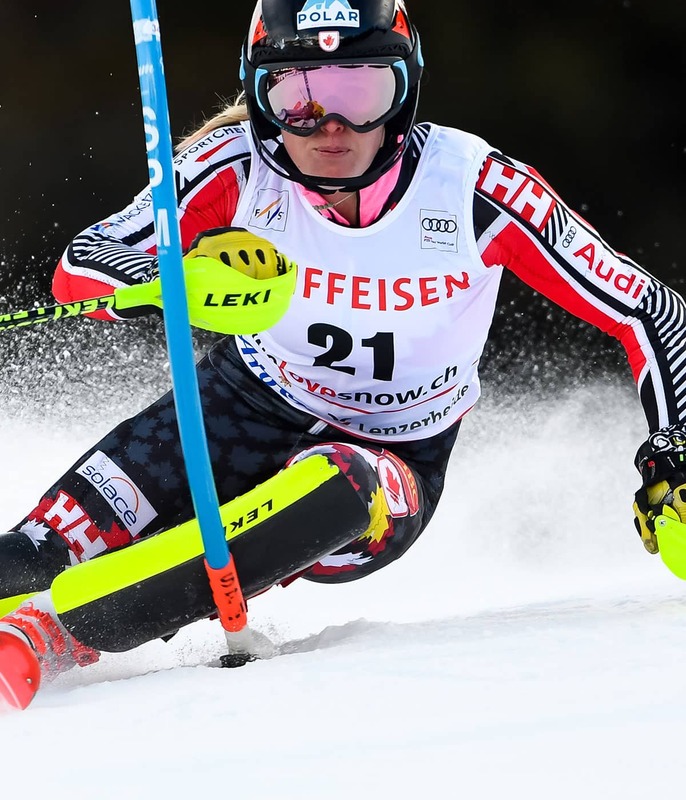 “Ski racing is hard for me at the moment, and I don’t want to confuse that with skiing or life in general. I’ve grown, I’ve become stronger, I’ve changed, I’ve listened, I’ve fought. I’ve failed again and again, and each time I’ve gotten back up. I shed some tears, but I forced my heart to beat again and plastered a smile on my face. But as hard as I’ve worked, as far as I’ve come, I can’t quite put it together. In some regards, this is heartbreaking, gut wrenching and shattering, but on the other end of the spectrum I am so unbelievably blessed. Today, I feel so incredibly thankful for the kindness that has emerged from these struggles; the cross-nations friendships that I have made, the advice that has been shared, the hugs that have been given, and the belief that has been shown when it is so utterly difficult to begin believing again. These next turns are for you; for those people that cheer even though I am a competitor, for those who meet me in the finish line with dedicated kindness, for those kids that inspire me, for my family who has stood by me, for my supporters who have become family, for my coaches who offer a kind word, when all of mine for myself are used up. I believe that this note, and not a gold medal, a chat with a hero, or a breakthrough season, was the real pivotal point in not just my career, but my life. At the next race I had the best result that I had had in two years, placing seventh, winning the second run and qualifying me for my third Olympic Games. I backed up this result with another top-10 finish, and two top-15 finishes in the next three races. As I’ve matured as an athlete, I’ve realized that the Olympics IS just another race, and that I have failed over and over again since 2010, which is why I’ve succeeded. I’ve learned that although I’ve sacrificed so much to be an athlete, I’ve also gained that much more. I’ve discovered how to treat myself with self-compassion, and how to be at peace with who I am. Each day I become more confident in my approach. I’ve found my spark and defined myself based on who I am as a person instead of my results. However, I will say this: I am no longer satisfied with just being a participant, as I was in 2010, and I am no longer defining myself by my results, as I was in 2014, but I will be a fierce contender in 2018. I think the difference now is that I have been given perspective. I can’t think in terms of success or failure, win or lose, podium or not, because what I have learned and taken from this sport is already a huge achievement. This will be my third Olympics and I feel like a kid in a candy store. I am so excited to see my Canadian Olympic teammates who I have become friends with. I am looking forward to wearing only red and white for 20 days straight. I am even eager to see what issues arise, laugh at the problems and watch how everyone will come together to solve these issues. I marched at the opening ceremony in -22 C temperatures wearing my heated socks, hand warmers and multiple layers because that is what the last eight years have given me; the realization that I am about to be a part of something so much bigger than myself with the knowledge of how to prepare for this. The Olympics is a time when the entire world puts aside their differences and unites as one. We compete against one another, but we do so with integrity, heart, respect and bravery. I will fly across oceans, I will don our Canadian colours, and I will greet my third set of Olympic rings. One part of me will be that young 19 year-old girl looking around in wonder, and another will be that 23-year-old workhorse training as hard as possible, striving for success and gunning for a medal. Yet the biggest part will be my 27-year-old self, who realizes that, "The most important thing in the Olympic Games is not to win but to take part, just as the most important thing in life is not the triumph but the struggle. The essential thing is not to have conquered but to have fought well — Pierre de Coubertin (The Olympic Creed). I cannot foresee what will happen in the upcoming weeks, however I can say with certainty that I plan to participate for Canada with integrity, bravery, heart, and I promise to fight well.